So Jack Bruce died. A whole age group of music fans felt a pang reading that for the first time. He was part of our young hipness process. One of those serious jazz loving bass players you’d find in rock bands back then, like they lowered themselves a notch to play loud blues and love songs. Which wasn’t true, really, but that was the thinking. Jack Bruce was the quintessential one of those. Kids would mention their favorite bass players and you could say Jack Bruce and be hipper than all of them. Ginger Baker too, though that didn’t last for me. He was just a pounder. Make him an astronaut. But Jack did stay with me. I remember watching that Cream reunion a few years ago on a hundred television sets in Circuit City, and aside from Eric Clapton’s solos, which were good, even fired up, the band was limp and weak and not the Cream I remembered from all my albums. Jack on a fretless bass didn’t help any. He couldn’t dumb it down just a little to slam through a Sunshine of Your Love or Tales of Brave Ulysses even though he managed the yelp in precious ears WERE tortured. But Deserted Cities of the Heart took on something new with his jazzier playing, and We’re Going Wrong (a favorite of mine off Disraeli Gears I’d forgotten all about) was gorgeous and spooky and perfect for him. His bass carried it. It was a couple levels above all the Cream classics, it seemed to me now, like a different band altogether. It knocked me out. I think Crossroads followed. His bass line had carried that one, too, on Wheels of Fire, Clapton soaring overhead, Jack keeping it together. Not at Royal Albert Hall, though, not in 2005. They’d rocked the place on their last show there back in 1969 (you can see for yourself in Farewell to the Cream, a standard in the hippie art house theaters back in the day). But not this time. Jack’s heart wasn’t in it. This Cream thing wasn’t what Jack Bruce was three decades on. He was beyond all this. I watched a hundred televisions thinking all those cheering people were seeing what I was seeing but they were hearing Disraeli Gears. That wasn’t the real Jack Bruce up there, the Jack Bruce who’d been growing in stops and starts ever since Cream said farewell. He was never a superstar again, but he was a musician, and kept doing interesting things, despite bouts of melancholy. Alas, I never saw him play, not even once. I intended to some day, but never will now. I no longer have any Jack Bruce records, either, and haven’t even heard his Tony Williams Lifetime project Spectrum Road from 2012. Or his very last, Silver Rails, from earlier this year. Everyone told me how good that one was. And you have to see him live, they said, he’s a legend, he’s Jack Bruce. I said I would, one of these days. Oh well. Sometimes you miss things, and then it’s too late. And my Cream albums are long gone, all of them. Even Live Cream Volume II, with its incredible take on Deserted Cities of the Heart, which would seem appropriate right now. 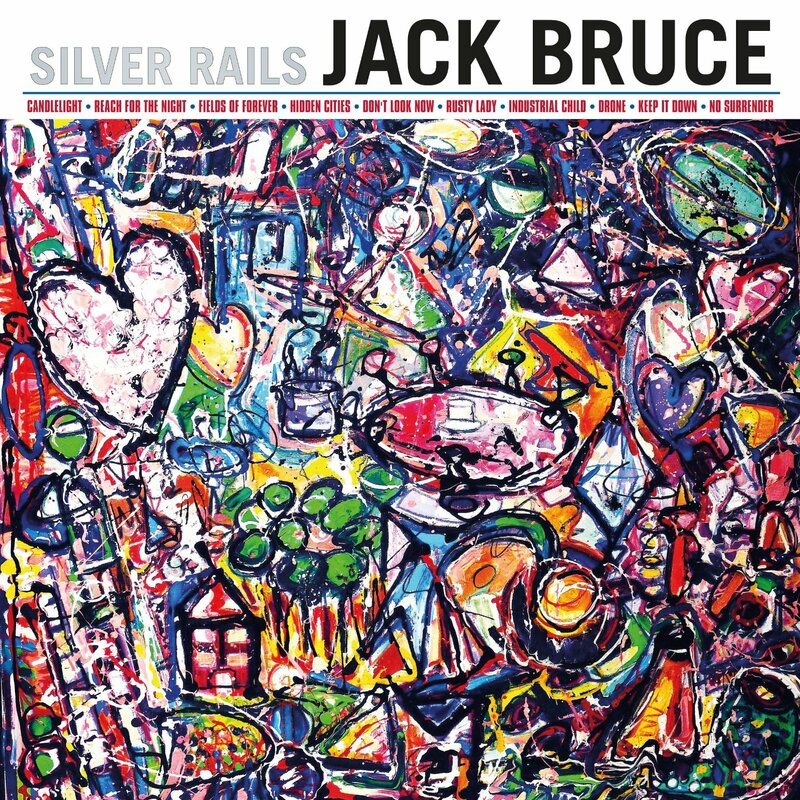 Jack Bruce’s final release, Silver Rails. The extraordinary painting is Sacha Jafri’s “The Child Within – The New Adventure”. Few musicians have the confidence or humility (or both) to share an album cover with something so extraordinary. This entry was posted in Jazz, Psychedelic and tagged Cream, Eric Clapton, Ginger Baker, Lifetime, Tony Williams. Bookmark the permalink.